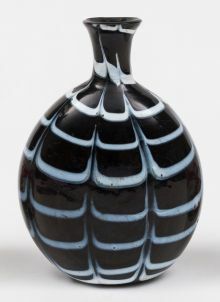 From the 17th century onwards glass making in Germany and Bohemia was fully established and the addition of potash and latterly chalk meant that in comparison to Venetian glass it was more robust and more able to take decoration. Primarily decoration took the form of diamond point engraving and particularly wheel cutting, the latter as the 19th century progressed, becoming increasingly deeper intaglio decoration, classically topographical in nature (spa towns a regular feature) and most common where hunting and sporting scenes. 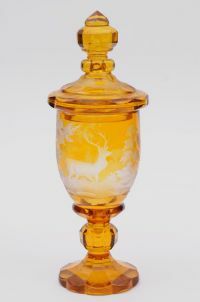 Also featuring heavily in the Bohemian repertoire was coloured glass initially milk glass, but especially popular was red (at a premium as it required gold chloride) closely followed by amber, green, blue and very occasionally amethyst. 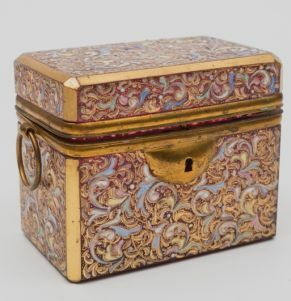 A profusely enamelled Bohemian glass table casket. 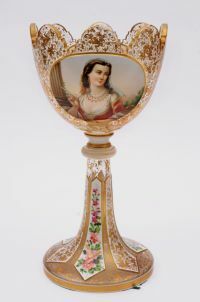 Again also enhanced with deep cutting and the application of coloured enamels or being overlaid with a further thin layer of coloured glass (primarily white), in turn decorated with enamels, female portraits being the most popular and flowers and foliage the most commonly occurring. It seems restraint wasn't considered an option as the coloured grounds on these sumptuous pieces were also enhanced with profuse and busy gold designs! The overlay technique was enhanced and refined by other European factories, very successfully, with single or multiple coloured layers being intricately cut back with a wheel or etched by the application of acid – both very time consuming and subsequently expensive processes with no margin for error. 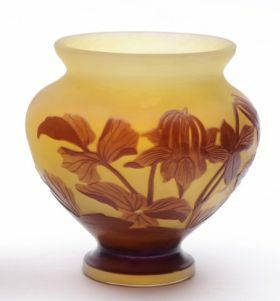 An Emile Galle overlay glass vase. In France, Emile Galle, after a 'working' trip to Germany in 1866, was probably the foremost exponent of the art, opening his first shops in Paris in 1885 and latterly one in London also. 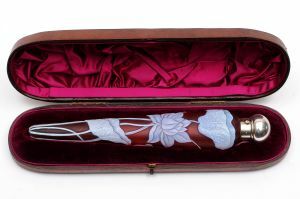 It was hardly surprising that in England Thomas Webb and Stevens & Williams adapted and perfected overlay glass technique to suit a broad range of tastes and pockets. A very smart Stevens & Williams glass scent bottle.